Whenever you need a receipt to claim warranty for your damaged mobile phone, this app will hold and find them all. What you should know about this receipt scanner app is that your monthly upload of receipts is restricted. Depending on your plan you can upload a certain number of receipts until your volume is exhausted. Get signed up for NumReceipt and upload receipts using a smartphone. NumReceipt Receipt Scanner and Tracker stores your data safely in the cloud server. You can sync this app with your credit card and match scanned receipts accordingly. Search/sort your receipts by retailers name, categories or notes. The app has OCR (Optical character recognition) to fill in Retailer and Total for you. Since this OCR is blind to line-to-line extraction, the data needs to be checked afterwards. But we from RSC gladly do it for you. What kind of report format does NumReceipt have? Generate your reports either in PDF/ XLS format. Tag your receipts automatically with OCR / GPS points. Update/ Calculate your exchange rates automatically. Backup your data to Dropbox or in SD cards. Manage your expenses by tracking everyday expenses. Get reimbursed by tracking your business trip mileages for tax purpose. How much does NumReceipt cost? In the free version, receipts will be scanned in black & white. Store up to 200MB of receipts which are approximately 5000 receipts. Manual entries of receipts are unlimited. Enjoy the features of SSL data security, PDF/ XLS/ zip image exported receipts and auto-uploading of eReceipts. Backup your data to Dropbox with OCR / GPS points. In Basic version, pay 9.99$ per year to scan your receipts in black & white. Get 200MB storage of receipts, approximately 5000 receipts. Enjoy unlimited manual receipt entries. Enjoy the features of SSL data security, PDF/ XLS/ zip image exported receipts, auto-uploading of eReceipts and calendar / Gallery view. Backup your data to Dropbox with OCR / GPS points. In Plus version, Self-employed should pay 33.00$ per year which is 2.99$ per month. To enjoy 1024 Mb (1GB)storage which is approximately 20,000 colour receipts. Enter receipts manually which has no bars, SSL security, PDF/ XLS/ zip image exported receipts, auto-uploading of eReceipts, backup your data in Dropbox or Google Drive with OCR / GPS points, Calendar/Gallery view, etc. Get 3 Multi-business / personal accounts. In Pro version, being self-employed pay 165.00$ per year, 14.99$ per month. 3072 MB (3GB) storage, approximately 60,000 colour receipts with 10 GB additional storage. Additional storage will cost 4.99$ per month / 49.99$ per year. Get unlimited Multi Business / Personal accounts. 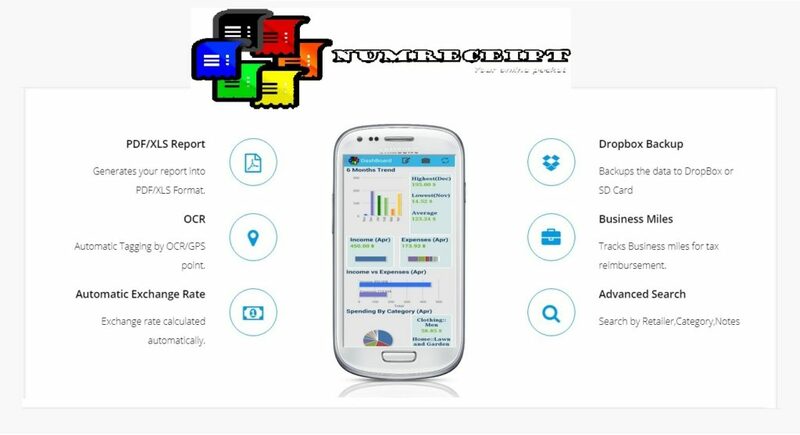 Enjoy the features of NumReceipt receipt scanner and tracker to make your business better. Storage up to 204800 MB (200GB), approximately 8 million of colour receipts with unlimited manual entries. Get SSL security, receipts exporting, auto eReceipt uploads, Dropbox and google drive backups with OCR, logo on the homepage, calendar/ gallery view, check account statement uploads, business logo in reports, P&L reports, tax & date extraction, auto exchange rate calculation and multiple currency support. All these features avail at just 999.00$ per year / 99.00$ per month. An unlimited number of clients at 14.99$ per client per month. Additional storage size of 10 GB at $4.99 per month/ $49.99 per year. The free version provides you to scan receipts in black & white. Store up to 200MB of receipts which are approximately 5000 receipts. Get SSL security, receipts exporting, auto eReceipt uploads, dropbox backups with OCR, logo on homepage and 1 client for 30 days of trial. All features at free of cost. Business free is about small business without employees, scans receipts in black & white. Storage up to 200MB (approximately 5000 receipts) with unlimited manual entries too. Free features of SSL security, exporting receipts, auto uploads of eReceipts, OCR receipts with dropbox backups. Business Basic is 9.99$ per year to scan your receipts in black & white with/without employees. 1 employee for small business at 4.99$ per month. Get 200MB storage of receipts, approximately 5000 receipts. Enjoy unlimited manual receipt entries. Enjoy the features of SSL data security, PDF/ XLS/ zip image exported receipts, auto-uploading of eReceipts and calendar / Gallery view. Backup your data to Dropbox with OCR. Business Plus version, pay 99.99$ per year which is 9.99$ per month. Enjoy 25GB storage, approximately 1 million colour receipts. Enter receipts manually which has no bars, SSL security, PDF/ XLS/ zip image exported receipts, auto-uploading of eReceipts, backup your data in Dropbox or Google Drive with OCR / GPS points, Calendar/Gallery view, etc. Get 3 Multi-business / personal accounts. A maximum number of 100 employees at 4.99$ per employee per month. Business Pro for 499.99$ per year, 49.99$ per month. 102400 MB (100GB) storage, approximately 4 million colour receipts with 10 GB additional storage. Additional storage will cost 4.99$ per month / 49.99$ per year. Get unlimited Multi Business / Personal accounts. Maximum 500 employee at 7.99$ per employee per month.